Oskar Fischinger's paintings are being exhibited at the art dealers gallery - Peyton Wright Gallery. These paintings are a real treat to view. 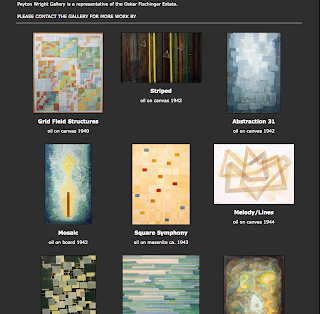 Peyton Wright Gallery have put many of Oskar Fischinger's paintings online, many of these have probably not been seen before, as they have not been put online before. Some of these paintings have strong musical themes. There are several that I really like and a beautiful one for me is, Layers of Sound. However, there are many others and Fischinger's very distinct artistic and aesthetic style is really apparent. 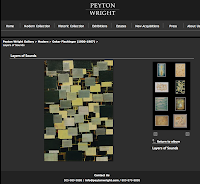 A great treat to be able to view these paintings online via the Peyton Wright Gallery, and if you are lucky enough to be near Sante Fe, a treat to see in reality.